Yesterday the Academy displayed just what a fractured organization they are, championing a small film like “Slumdog Millionaire,” for which I applaud them, but snubbing “The Dark Knight,” one of the best reviewed films of the year and a titan at the box office. All day I was asking, ‘How?’ All day I wondered just how out of touch this organization truly is and what a major overhaul is needed. Call it ageism if you must, but we I think we need new blood in there. I have been covering the Academy Awards for more than 20 years and have had my share of disappointments and shocks over that span of time. One would think I’d get used to it. I remember the rage when “Ghost” was nominated for Best Picture and when Roberto Begnini won Best Actor. That anger and shock was nothing like I felt yesterday morning at 8:30 Ontario time. I could not speak. I closed my office door and quietly raged, trying to make sense of it. Reading the other reactions helped ease the wound (I take it personally you see when my films are snubbed) and tried to see the good in the nominations this year. And as Guy astutely points out, there is some good. Melissa Leo in “Frozen River” made the cut, as did Richard Jenkins for “The Visitor.” Both deserved, both terrific performances. “Wall-E” grabbed a screenplay nod, as well as sound nominations, and “Slumdog Millionaire” did very well indeed, with 10 nods. “The Curious Case of Benjamin Button” lead the pack with 13 and Brad Pitt finally got a nomination for Best Actor — long overdue. Mickey Rourke and Marisa Tomei made the list for “The Wrestler” and all four major actors from “Doubt” are nominees. Mike Leigh was nominated for his “Happy Go Lucky” script and Clint Eastwood’s longtime cinematographer Tom Stern was nominated for “Changeling,” richly deserved. 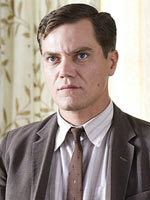 It’s great to see Michael Shannon in the supporting category for “Revolutionary Road.” At least the film got something. And as much as I love Eastwood, I was happy he wasn’t nominated for “Gran Torino” because we would have seen one of those ridiculous sentimental awards on the horizon. Though I love “Changeling,” I was shocked that Angelina Jolie slipped in lead actress over Sally Hawkins in “Happy Go Lucky” and Michelle Williams in “Wendy and Lucy.” The lack of love for “Revolutionary Road” did surprise me because the actors make up the largest branch of the Academy and the film was an actors’ dream…er, nightmare (this year). Where are the screenplays nominations for “Road,” “Changeling” and “The Wrestler?” Why is “Waltz with Bashir” not among the nominees for animated feature? Finally how is it that the greatest rock-and-roller ever, Bruce Springsteen, is snubbed for his mournful tune to “The Wrestler” while two from “Slumdog Millionaire” get in? More than any single song from a film last year, Springsteen’s tune captured the essence of the pic to utter perfection and complimented the movie in every way, adding a texture that remains haunting. So yeah, I’m pissed. I might not even watch this year. Maybe I’ll put in the “Dark Knight” DVD instead. Watching Shotgun Stories last night really made me appreciate Michael Shannon more. If Rourke can win, I will be happy and forgive Slumdog’s likely win. I know everyone’s upset about “The Dark Knight”, and rightly so, but can we talk for a bit about “Wall-E” and how unbelievably ludicrous the Best Animated Feature category is? The movie’s well-deserved screenplay nomination indicates the Academy members took it seriously as a film, but no one ever thought it had a legit shot of landing a Best Picture nod. Why? Because voters could dump it into Best Animated Feature. That way, they can console themselves that they’re giving appropriate recognition to the movie by separating it from other “cartoons” while using the actual Best Picture category to focus on “real” movies. You need to be more objective, this year this sites are becoming to bitter and square minded. If my favorite gets nominsted is all ok but if it’s not then for now on I hate the Academy? Is this the way to run a serious website? Springsteen was the worst snub of all. I’m not a big fan of The Boss, but that song was absolutely the perfect ending for the film in every way. And, the song works on it’s own as well. Jai Ho is fun, and since I don’t speak the language, I have no idea if it has anything to do with the film. Possibly, it fits perfectly too, or possibly it is just a up Bollywood ending that you can dance to. John doesn’t run the site, Alfredo. I do. And I’m happy for him to post his passionate comments, no matter what they are. So yes, even though your question is rhetorical, that is the way I run MY site. I don’t know what it is with people wanting those who are irritated by the nominations to censor themselves. Jeremy, I’m glad to finally see another person who agrees that the Animated category needs to go. Not only is it keeping worthy Pixar flicks out of the big race unfairly, but there just aren’t enough worthy animated films each year to justify the category. Kris – well said. I really don’t understand why folks don’t get the outrage towards the Academy. They criminally missed the boat. I’m right with you on most of these points, John. But I’m iffy on Brad Pitt’s nomination — hardly his most interesting work. I’d much rather see Leonardo DiCaprio filling his spot. And Alfredo: We’re discussing a creative artform here … how exactly do you keep subjectivity out of it? By the way, I can’t agree that the Best Actress race has “opened up” — quite the opposite. Winslet’s sole nomination eliminates the possibility of a split vote, while there’s obviously widespread support for “The Reader.” She has it in the bag. Game over. I pretty much was pissed all day yesterday because of this incident. But I have come to realize that not nominating the dark knight was actually a good thing. Because 1. When over movie win or get nominated people look back and so hate on. Look at titanic, lord of the ring, deperated, Shakespeare in love. The movie that hasn’t been nominate viewed as a classic, memento, and heat. In 20-30 will any of the nominee be rememered? The dark will go down as a classic and will be have it’s box office to go with it. For comic book to be considered as top contendor is huge step for the oscar. It also the first comic book to get nominated at the critic award, producer, director and writer award. This year the dark knight accomplished so much and every day know, IT WAS THE OF THE YEAR!!!! The most talked about and the most wacthed. If the academy don’t want to reward that, it’s their lost. Alfredo, the seriousness of a certain group of people is what got us here in the first place and is what we are lamenting. What makes a website, or anything else for that matter, serious then? What is good about that? Also, though it hasn’t been said on this thread (yet), I find it quite amusing that the WALL-E supporters tell TDK fans to calm down and quite bitching and they call us fanboys, while they usually proceed to throw in a couple of paragraphs on how they hate they Oscars and won’t watch because WALL-E was snubbed. Hypocrite anybody? Also, it sends chills down my spine thinking of the Joker’s most famous and recognized line in light of this aftermath, almost as if addressing the Academy themselves. Guy, at first I thought you were predicting too boldly that the Actress race is all but over, but now I’m kind of in agreement. I pretty much was pissed all day yesterday because of this incident. But I have come to realize that not nominating the dark knight was actually a good thing. Because When a movie wins or gets nominated people look back and hate on it. Look at titanic, lord of the ring, deperated, Shakespeare in love. The movie that hasn’t been nominate that are viewed as a classic, memento, and heat. In 20- 30 years will any of the nominee be rememered? The dark will go down as a classic and will be have it’s box office to go with it. For comic book to be considered as an oscar nominee is a huge step for the oscars. It also the first comic book to get nominated at the critic award, producer, director and writer award. This year the dark knight accomplished so much and everybody knows, IT WAS THE MOVIE OF THE YEAR!!!! The most talked about and the most wacthed. If the academy don’t want to reward that, it’s their lose. i love the dark knight as much as everyone but the criticism of the academy is totally ludicrous. star wars, raiders of the lost ark, titanic, gladiator, (to a certain extent) the sixth sense, are all huge commercial blockbusters that were nominated for best picture. the dark knight was simply not number one on voters lists (which is how the nomination process is tallied). Jason — right you are, and because those films were indeed nominated is precisely why “The Dark Knight” should have been. Alfredo — ….ahhh, forget it, Kris said it better dude. Kris, again thanks for the chance to write on this site, to share opinions and emoitons, and to learn from so many other like minded people. What a bunch of Boabies!!! Who ate all the pies? Umm…. that would be Harvey Weinstein, DOH! I saw Michael Shannon’s “The Missing Person” at Sundance and was surprised to see him in”The Greatest”. That man’s talent is incredible. Maybe the academy clearly knew more than us on this one. john foote, i think tdk should have been nominated just like other blockbusters that weren’t (empire strikes back above all), but my point is it just seems like everyone thinks that the academy never honors blockbusters… rotk was showered with oscars. Kristopher: I respect your opinion I just thought that a writer of a site dedicated to the Academy Awards would analize the decisions they make and not concentrate in bitching about them. It looks like you don’t even like the Oscars at all or only when the Academy selects the films you like. Guy Lodge: Of course there’s subjectivity but like I said before, I thought that this type of site would have a more objective approach to the AMPAS decisions. J: Sorry, but I don’t get the outrage at all. I had to wait 10 years to see PT Anderson nominated but i didn’t hate the Academy all those years. Another thing, is funny that if the Academy nominate a obscure dark non commercial film like NCFOM or TWBB that people didn’t understand but you like instead of more commecrial stuff then is OK, but if they choose a film like that instead of a Batman film (which I love) then it’s not a good decision. I just don’t get it. Frost/Nixon and The Reader got more 1st place votes than The Dark Knight, really? I guess all the die hard fans of F/N and TR have been hidden pretty well. I have read and heard the Slumdog fans speak loudly, the TCCOBB fans, the Milk fans, and for sure TDK fans, where were the F/N and TR superfans (those who thought the movie was #1 of the year) all this time? Man, it’s like the academy is living in some alternative universe where TDK never was made. Mistake: I know PTA was nominated for original screenplay for Boogie Nights and Magnolia. I meant a PTA film being in the Top 5 (There Will Be Blood). Your black and white vision does not let you comprehend terms like subjectivity, bitching, hate, commercial stuff, between some others. I think you are overreacting. I agree that The Dark Knight was an incredibly impressive film in both its technical and creative achievements. Its position as (unadjusted for inflation) the second highest grossing film of all time is equally impressive, but also completely unrelated to its worth as a potential contender for any category. Lots of great movies have done little business at the box office (City of God, Diving Bell, Good Night and Good Luck just to name a few recent examples) and still deemed worthy of nominations in major categories and near unanimous critical praise. Conversely, a number of truly awful movies have made ridiculous amounts of money (Indiana Jones and the Kingdom of the Crystal Skull, Transformers, etc.). I only mention this because critics, especially on this site, seem to imply that The Dark Knight’s high gross and lack of major nominations means that the academy is out of touch. In reality, it probably means that the AMPAS is not really interested in the money a movie makes, but rather its quality. I think we can agree that that’s advantageous for the whole process. Moreover, The Dark Knight was not the greatest movie ever, as this site seems to be implying with its ridiculous bias and angst. Its third act was totally unnecessary and slightly incoherent. It was incredibly long with some totally tangental plot lines (the scenes in Hong Kong for example). But more importantly the characters that were crafted for the screen, while gripping, did not prove emotionally visceral. There were few tears when Maggie G. died or when Two Face perished. The Joker was amazing and haunting, and look at the nomination and likely win Heath Ledger has gotten. There were gasps during The Dark Knight, a sign that the movie was absorbing, but not tears or stunned silences, a sign that a movie has truly made an impact. Much of the anger about The Dark Knight’s perceived snub has been directed at Stephen Daldry’s The Reader. I agree that it is far from the best movie of the year. The Reader is uneven and sometimes exploitative, but its also supremely well made and directed. The performances are spectacular, Kate Winslet in particular (who is definitely the center of the movie, I’m not really sure how she can be argued to be supporting), and at the end of the movie I was genuinely moved despite the films imperfections. It was not pornographic as some seem to claim. It used nakedness to exhibit frank and impressively acted vulnerability. The screenplay was cleverly crafted and Daldry managed to combine all of this into a never dull and ultimately though-provoking film. More than that, Slumdog or Milk or The Curious Case are similarly good but not perfect or superlative efforts. Paranoid Park is better and more visually and emotionally arresting Van Sant. Synecdoche, New York is a more stunning achievement in combining intimate story telling and a sweeping, epic plot than Fincher’s uneven film. Slumdog is great and uplifting, but Rachel Getting Married and I’ve Loved You So Long are more powerful and impressive in terms of their emotional wallop. Even Frost/Nixon, which even supporters admit is relatively average, isn’t the best political film of the year. That title probably belongs to Wall E or Waltz with Bashir. In the end, the nominations weren’t perfect. They were not tragic, as you imply; they were not phenomenal. They represent a reasonable consensus of what movies were the best this year. Some people get left out, that’s part of it. Money or campaigning aren’t the reason, otherwise The Dark Knight would certainly be in, its that people have different opinions and the list of nominees represents a consensus of people who are deemed worthy of membership. Its the AMPAS’s party and they can invite whoever their members want to recongize. Its nothing to get upset about, as you clearly have. Doing that ignores the point of these awards: to celebrate. If you don’t agree, don’t tune in. If you think that they’ve made a bad decision and snubbed a great film, be content to know that you got to enjoy it in another great year for movies. Paragraphs are our friends, MS.
I’m sorry! I have an old Mac and it won’t let me change lines for some reason! That’s what I’m talking about. I love films and I love the Oscars! And when a film that anybody expects to be nominated enters the top 5 I say cool now there’s another film to look out for. Sorry if my english is not very good. I speak spanish. Sirio11: my black and white vision??? You are the ones saying The Dark Knight nominated good, The Reader nominated bad. The Dark Knight not nominated = there’s no justice in the world and the AMPAS must burn to the ground and their children be shot. The Dark Knight in blu-ray looks even better. And because they rewarded LOTR:ROTK is the very reason they should have honored Dark Knight, at least be consistent and fair — Alfredo, no where do I state I hate the Oscars, I just, from time to time resent their stupidity — do you really think I will not be watching??? Come on dude, seriously….film is my life, like it or not, Oscar night for me is work. But worek I love. The thing is, with the LOTR wins, I always thought that the Academy embraced it simply because what it really was was high literature Oscar bait disguised as a Christmas blockbuster. The only true popcorn blockbuster nominee of the past 10 years that I can think of that doesn’t associate itself with any of the themes the Academy loves (high literature, sword and sandals, etc.) is The Sixth Sense (and, to an extent, The Departed). Which is why The Dark Knight’s nomination would have truly been groundbreaking in the sense that the Academy is, indeed, willing to embrace one of the Best Pictures, even if it lies outside a genre/theme that the Academy is comfortable with. M.S. : You mentioned several movies in your post. Movies that either had a strong box office but weak quality like Transformers (which, I didn’t really see what the fuss was about afterwards), or excellent quality but not a spectacular boxoffice showing like Good Night, and Good Luck (which I personally thought was boring as hell, but that’s another discussion). The thing is, The Dark Knight and WALL-E had both of these things. I’m sorry if you thought the third act being a mess meant the whole movie should be disqualified from BP. However, a) as much as they may hate to admit it, TDK detractors are squarely in the minority of filmgoers, critics, and filmmakers, and b) it seems to me that “the third act” is the most prominent criticism anyone can come up. “Too long?” What about The Curious Case of Benjamin Button, which spends more than half of its running time on Ben’s life as an old man and then montages its way through Ben’s middle life with Daisy before relegating Benjamin’s last years to two scenes with young boys. There might be another reason why The Dark Knight wasn’t nominated, and it’s something I feel everybody is forgetting. It’s a sequel, and the original was not nominated for Best Picture. When sequels are nominated, their originals were usually nominated as well, just like all three Lord of the Rings films, and all three Godfather films. And, personally, I thought Batman Begins was a more coherent film, and I was more impressed with it, because the novelty of Christopher Nolan’s view of Gotham City drove me through that film (as did Christian Bale’s amazing performance). Seriously, everyone talks about The Dark Knight taking superhero films to a whole new level, but I feel Batman Begins did that three years earlier, only it made less money, and I honestly believe Heath Ledger had something to do with TDK’s success (maybe not his Death, but his character and performance definitely). So, I’m not saying The Dark Knight is a bad film, in fact, I really like it, I’m just offering another theory. If the Academy didn’t embrace Batman Begins, then why would they embrace The Dark Knight even if it is a better film? Heath Ledger’s performance was all the rage even before the film was released. My guess is that the AMPAS saw through (what was in their eyes) a flawed (and very commercial) film and realized that Ledger was the biggest and best part of ‘TDK.’ This is not how I feel towards it (I loved the movie), but merely what I can imagine the old fogey’s at the Academy feeling. I’ve been watching the Oscars religiously for the past twelve years and have only agreed with about a quarter of their best picture nominees. In the past I’ve shrugged it off when the Academy dropped the ball, but ‘The Dark Knight’ snub really blows my mind. I’ll just be glad when I never have to hear the freakin’ words THE DARK KNIGHT ever again. I’m so sick of hearing about it I could puke my guts out. Raging over the best-pic-category snubbing of an overextended comic-book sequel that minus a single (nominated) performance would have been terminally “OK to decent” seems a tad much. The Reader is what the Academy preferred, and they are the Academy (not Blogger) Awards. Blaming Weinstein for promoting the hell out it (and likewise Lionsgate for beating the drums so effectively for Crash) is off-point, as clearer heads have indicated. The whole thing is a game – and hardly some hint as to true cinematic quality as a quick scan of several past years clearly shows. Plus the only film (not performance in a film) that will be wholly remembered from this year long into the future is “WALL-E” and that was implicitly disqualified – the real crime of the Oscars by far.